Conveniently situated in walking distance to shops, banks, restaurants etc. Just a 5 minute drive to the centre of Durban, 15 minutes to the "golden mile" of beaches and 40 minutes from the King Shaka International Airport. We are 2 minutes from The University of KwaZulu Natal and 2 minutes away from Entabeni & St.Augustines Hospitals. Your hostesses, Charisse and Anita Shepherd, world travelers themselves, whose motto is"we aim to please", ensure a safe, comfortable, homely environment and guarantee they will do everything for you to have a memorable stay at Chelmsford House. 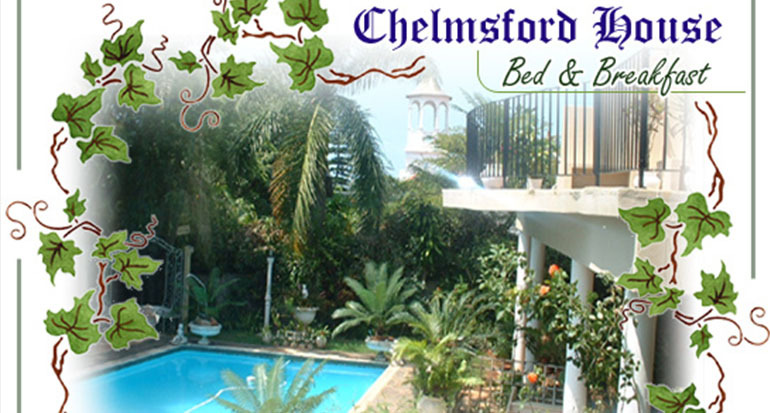 Looking to book cheap flights to Chelmsford Bed & Breakfast? Facilities: Guests have the option of B&B or Self-catering, with access to the fully equipped guest kitchen. All rooms are en-suite with air conditioners or with ceiling/standing fans. Tea/coffee trays. TV with M-net. Secure parking. Children welcome. Regret no pets. Special rates for group/student or long stay bookings. Access to fully equipped Guest Kitchen T.V. with M-net. Fans in the room. All duvets, linen and towels are provided The rooms are serviced daily.